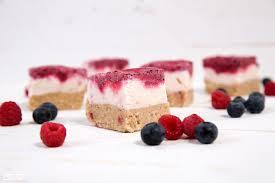 Try this Healthy Family Recipe, its great for the whole family when a sweet treat is required. mix all ingredients in a bowl. Pour over the hardened base and place back in the freezer for around 1hr before adding the topping. Blend ingredients in food processor until smooth. pour over the yoghurt filling in the loaf tim and place back in the freezer. Slice and serve once frozen through.